The Ratha-Yatra or Roth Yatra or Chariot Festival is a Hindu festival that involves transporting deities on a chariot (called a ratha or roth). The word "Ratha" stands for "chariot" and "Yatra" signifies "journey". 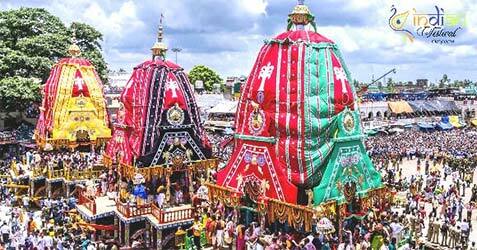 Rath Yatra is the only day when devotees are not allowed into the temple and they can get a chance to see the deities. This festival is a symbol of equality and integration. The festival is also known as Gundicha Yatra, Ghosa Yatra, Navadina Yatra, Dasavatara Yatra and by a variety of other names. Ratha Yatra, the Festival of Chariots of Lord Jagannatha is celebrated every year at Puri, the temple town in Orissa, on the east coast of India. This festival is celebrated every year on "Ashadhasukladwitiya" ie the 2nd day of Shukla Paksha (waxing cycle of moon) in the month of Asadh, the 3rd month according to the Hindu lunar calendar. The famous festival that is celebrated when the chariots of Lord Jagannath accompanied by his elder brother Balabhadra and sister Devi Subhadra are brought out on to the Main Street of Puri known as Bada Danda, allowing the public to have darsana (Holy view) and travel (2 km) to the Shri Gundicha Temple to their aunt`s house where the deities enjoy a nine days stay and are served with sweet pancakes. The Puri Rath Yatra is world famous and attracts more then one million pilgrims every year, not only from India but also from the different parts of the world. The Jagannath Mandir in Jagannath Puri is one of the four most sacred mandirs in the four directions of the Indian sub - continent. The other three are: Rameshwar in South, Dwarka in West and Badrinath in the Himalayas. Probably the mandir in Jagannath Puri is the only mandir in the world housing murtis of three deities who are siblings - Lord Jagannath, his elder brother Lord Balabhadra and their sister Subhadra are worshipped within the temple. The idols of these three deities are also made of wood and they are religiously replaced by new ones in every 12 years. The icon of Lord Jagannath, Lord Baladeva and Subhadra are a carved and decorated wooden stump with large round eyes and with stumps as hands. It is made of wood, which is an exception to common Hindu iconographic deities of stone. The temple is a majestic structure, 65 metres high and stands on an elevated platform in the heart of the city. It was built during the twelfth century A.D. in the Kalinga style.